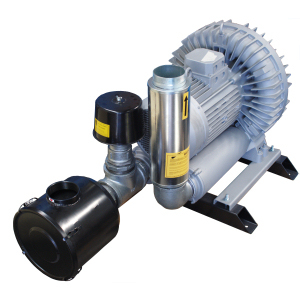 Side channel blowers are high quality cast aluminium and machined to fine tolerances ensuring optimum performance. Most units are available ex-stock Melbourne and all come with a 3-year warranty. Accessories such as silencers, pressure / vacuum relief valves & inlet filters are also available ex-stock Melbourne. Positive displacement blowers are available in coupling driven and vee-belt drive configurations. Variations in these configurations are available in order to suit exact installation conditions. Packages are available consisting of blowers, silencers, filters, acoustic enclosures and many other features.